We’ll explain what broad search terms are. Why it is best to avoid their use. And what to do if using them anyway. Please click on the image to view. 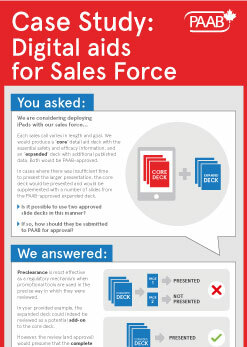 Is it possible to create a 'core' detail aid deck with the essential safety and efficacy information, and an 'enhanced' or 'expanded' deck with additional published data? Staying connected with patients and physicians through mobile apps is becoming ever more prominent. Let's look at some simple do’s and don’t to help you get up and running. 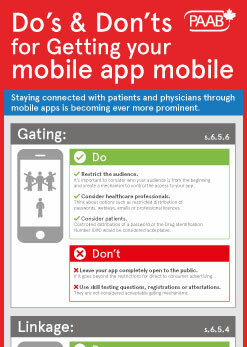 You can download the Do's and Don'ts for getting your mobile app mobile interactive pdf by clicking on the PDF below. ​Please click on the image to view. 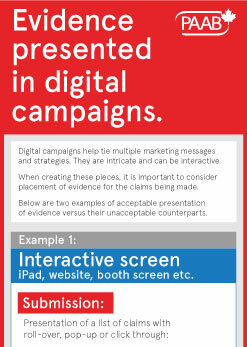 You can download the Evidence presented in digital campaigns interactive pdf by clicking on the PDF below. The case study will walk you through two examples two examples of acceptable presentation of evidence versus their unacceptable counterparts. 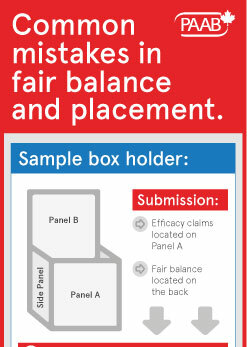 You can download the fair balance interactive pdf by clicking on the PDF below. 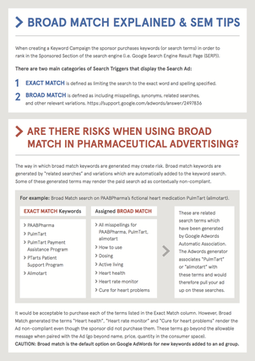 The case study will walk you through fair balance selection and placement, supporting you to select and position fair balance in your drug's advertising campaign. 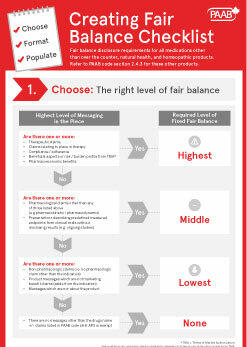 How to choose the right level of Fair Balance. What format to present the Fair Balance. What to include in Fair Balance. ​​Download the PDF document to walk through a social media submission including the PAAB rulings, reasonings and revisions. 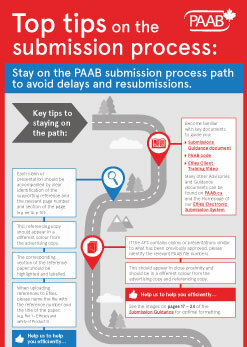 Download the PDF document to understand and explore the key steps of the PAAB approval process. ​Please choose a version to view. The following document provides general guidance on branded patient information for prescription products and products for the treatment of schedule A diseases. Health Canada encourages the distribution of part 3 consumer information in its entirety. However, the PAAB Code allows for editing of part 3 to facilitate patient understanding of their treatment and condition as per PAAB code section 6.4.3. While not exhaustive, the 5 main sections of this document address common types of information that are submitted in patient directed material. The information provided below is in accordance with PAAB code section 6.4.3. Company controlled or prepared branded patient information is information that contains non-promotional material that is consistent with, and in addition to, the consumer information section of the Product Monograph (PM). The information should focus on educating patients about particular diseases/conditions and optimal use of the product by the patient for whom it has been prescribed. a. In general, information from part III of the PM may be used in patient information when presented with similar context and prominence. iv. repetition of a message. b. Multiple indications, routes of administration, and/or formulations for the product may be included in the same patient piece provided these are covered in the same part III within a PM. If there are multiple part III sections, covering different indications, routes of administration, and/or formulations, within the same PM, the client must separate the patient pieces accordingly. c. There should be no discussion of other Rx therapies that a patient has not been currently prescribed. It may be possible to discuss two products to be used concurrently providing it is clear at the outset of the APS that the piece is intended to be distributed to patients who will be using both products concurrently. a. Cautionary messages for dosing and administration, from part I, may be considered in a patient APS even when there is no mention in part III, e.g. “Drug X should be taken with food” as per part I with no other administration instructions in part III. b. There is an option to include the indication statement from part I.
c. Adverse event incidences from part I of the PM are NOT accepted. See the January 2011 edition of the PAAB Newsletter. Non-promotional information is copy that is presented in a manner that does not alter or form the user's opinion of the medication. Promotional claims, whether implicit or explicit, intended or unintended, are not accepted. The following are general considerations when differentiating the two types of copy. a. Copy text: "Drug X offers the flexibility of dosing with or without food once daily" vs "You can take your Drug X tablet with or without food once daily". The former highlights a benefit and is considered promotional. The latter can be non-promotional when presented in an informational context. The context, visual emphasis and frequency would be determinants. b. Copy context: Presenting product features in a context that attributes a benefit status or equivalent, is considered promotional. The bullet “Drug X is taken with or without food once daily” is rendered promotional if presented in the context of the subhead "Benefits of Drug X". A subhead such as "Things you should know about Drug X" would be deemed informational and non-promotional. c. Visual emphasis: Visual emphasis such as callouts, buttons, banners, Nabiscos, taglines, etc, on a feature of the drug which may be considered beneficial is promotional even if the feature is mentioned in part III of the PM. e.g. Verbatim part III copy “Drug X can be taken with or without food once daily” in a large callout is considered promotional. If it is important that the copy appear in a callout, the tone may be adjusted to be explicitly cautionary or instructional, e.g. “Remember to take your Drug X once daily with or without food”. d. Copy frequency: Frequent repetition of a feature, which can be considered beneficial, can render a message to be promotional. Claims such as “Now on formulary” or “Wide range of coverage”, or “Covered in many provinces” have a promotional tone. They are not accepted in patient information. 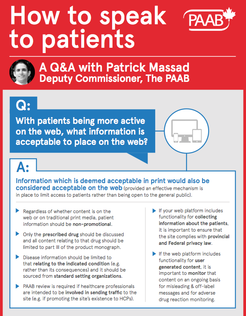 PAAB will consider formulary messages when presented in an informational context. e.g. “Patients in Ontario, NB, Alberta, and Quebec may qualify for provincial coverage. Talk to your HCP to find out if you are eligible for coverage". The second sentence alone may be considered as well. This message should not be a callout as the emphasis would render it promotional. PAAB will also consider “Call our program agents and they will try to get coverage for you” as it highlights a patient program service rather than coverage as a feature of the product. The content and context of the copy will determine the requirements for safety information. The following are general guidelines for inclusion of safety information. The APS includes information on how the drug works and its various features from part III. Tracking tools and/or how to prepare, dose, and administer the drug. Non-pharmacologic modalities to help maintain a healthy lifestyle while on the drug. Acceptable references for disease information include medical texts, guidelines, review papers, epidemiological studies and recognized standard setting organizations. Disease information in any section of the TMA can be presented in a non-emphasized, non-promotional manner in branded patient info. Disease information cannot be selectively presented to suggest uses or effects which exceed the TMA. The following subsections provide common topics and guidance on their presentation. Presentation of a validated list of the usual signs & symptoms of a condition, in a disease context, may be considered when the product is indicated for treatment or prevention of that condition. This may be considered even if the indication is broad, e.g. ‘Indicated for the treatment of OAB’ or if there is no mention of those symptoms in the PM. The list should not be selective such that is it extends beyond the limitations of the indication. Please see 2.2 below. Please note that for indications that are explicitly limited to specific symptoms then the disease information is also limited in a similar manner. Acceptable references for disease information include medical texts, guidelines, review papers, epidemiological studies and recognized standard setting organizations. Disease information in any section of the TMA can be presented in a non-emphasized, non-promotional manner in branded patient info. Disease information cannot be selectively presented to suggest uses or effects which exceed the TMA. The following subsections provide common topics and guidance on their presentation. c. Part II of the PM states that the drug has an effect on the symptom(s). It may also be considered when the PM includes clinical trial data that indicates an effect by showing statistical significance for the symptom(s). If this is the singular basis for inclusion in the piece it must be limited to a disease information context only. It may be not presented as a drug related effect/outcome. For ‘a’ and ‘b’, the presentation is not limited to a disease information context and may be presented as a drug effect if this is consistent with the indication/part III. c. Part II of the PM states that the drug has an effect on consequence(s) or indicates an effect on the outcome(s) by showing statistical significance. If this is the singular basis for inclusion in the piece it must be limited to a disease information context only. It may not be presented as a drug related effect/outcome. For ‘a’ only, the presentation is not limited to disease info context unless the relevant portion of the indication/part III statement is a disease info statement. As vaccines are indicated to immunize against a disease, it is acceptable to discuss disease consequences that the disease may cause, even if scenarios a, b and c above do not apply. The rationale is that the patients do not have the disease for which the product is indicated to prevent. Conveying the consequences of the disease promotes public health as it explains why a patient is being vaccinated. For such presentations, a prominent disclaimer such as “Vaccine X is not indicated to reduce consequences of Y”, should be included on the same page/spread. In addition, a disclaimer similar to “Vaccine X does not prevent all cases of disease Y. Not everyone may not be fully protected by Vaccine X”, should be included somewhere prominently in the APS. This may be considered in the context of differential diagnosis only. The presentation must be clear regarding the drug’s indication AND what it is not indicated for. e.g. “Your doctor prescribed Drug X to help you treat your allergic rhinitis symptoms, do not use it to treat symptoms indicative of the flu. The following chart will help you differentiate between the symptoms of allergic rhinitis and flu”. This may be considered similar to 2.4 above with the addition of a disclaimer clearly noting what the drug is not indicated for. e.g. "You are prescribed Drug X because you have stage 3 or 4 disease. Here are ways this stage differs from the others" and follow with disclaimer "Drug X is not used for…”. Triggers for the indicated disease are accepted. Triggers for specific symptoms are acceptable providing the symptoms are acceptable as per the symptoms section, 2.2, above. Explanations of disease scales, e.g. HAM-D for depression, may be considered provided they are not off-label AND the tool(s) are validated for health care professional monitoring of patients receiving therapy. The scales should be consistent with consensus guidelines or the PM. The content must be limited to a description of the scale, e.g. “Your doctor will use this tool to measure how the disease and treatments are affecting your depression”. The claims should be non-promotional, e.g. Note the term “affecting” rather than “improving” to keep the statement directionally neutral and thus non-promotional. 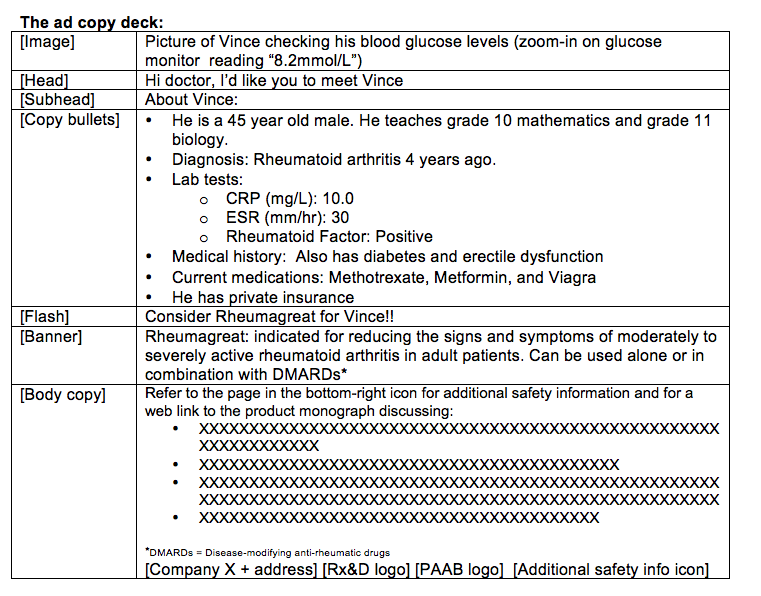 Tables/Graphs for patients to track signs and symptoms of the disease as treatment are considered in the context of monitoring signs and symptoms. It should not be presented as improvements in the condition as this is considered promotional. The metrics which act as the basis of the table/graph must be directly related to the indicated condition, NOT other conditions or consequences of this condition. They should adhere to the general principles in the symptoms section in 2.2 above. e.g. For a hypertension product, there may be a table to track home reading of systolic and diastolic BP +/- heart rate but there should not be a column for blood glucose level. Must follow the guidance provided in the relevant portion of this document’s section 2. 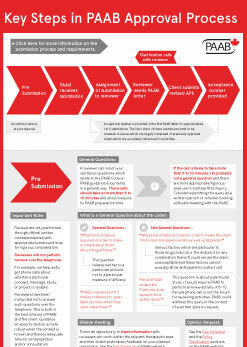 Must follow section 4 of this document for guidance on promotion of company services. Promotion of a company’s services may be considered, providing there are no drug specific claims, e.g. “Company X is proud to cover up to the difference between brand and generic price”. A claim such as “Price of Drug X has been reduced” is not accepted in a patient piece as it is a direct claim of benefit for the drug and is promotional. Non-pharmacologic lifestyle information such as diet, exercise, meditation, counselling, etc., may be included in patient information when explicitly presented as lifestyle information. The benefits and outcomes may not be extended to suggest a concurrent drug effect. e.g. “Along with your medication, diet and exercise can help reduce your cardiovascular risk”. Review Tips: What constitutes current medical opinion & practice? What constitutes current medical opinion & practice? PAAB code s3.2 requires that claims be consistent with current Canadian medical opinion/practice. PAAB considers a claim’s alignment with authoritative Canadian consensus guidelines as evidence of consistency with current Canadian medical opinion/practice. This is based on the fact that consensus guidelines are widely recognized to be useful aids in clinical decision making. Publication and peer-review does not necessarily indicate that a document is reflective of Canadian medical opinion/practice. Nor does the presence of the word "guideline" in the document’s title. In fact, a wide spectrum of published documents are sometimes referred to as “guidelines” including review papers, systematic analyses, and single sponsored papers describing an invited panel’s therapeutic opinions/recommendations. Also note that while some documents are created through appropriate consensus development methods, they might not be endorsed or recognized by an authoritative medical body and therefore may not be reflective of current medical practice (thus falling short of meeting the requirements of PAAB code s3.2). For PAAB approval of drug claims based on guidelines, the document must be endorsed and/or recognized by a national authoritative medical body. This is true whether the document is the original guideline or an update to the guideline. Typically, this recognition is evidenced by mention of endorsement from the medical body within the guideline. PAAB would also consider appearance of the document on the authoritative body’s website as evidence of recognition. If need be, PAAB could also accept a letter from the authoritative body (on official letterhead) as evidence of endorsement. Such letter must be framed so as to express the position of the organization as a whole, not the position of an individual. Which claims can be supported by authoritative Canadian consensus guidelines? Note that content from Canadian consensus guidelines is not automatically accepted in APS. All PAAB code provisions must be considered and adhered to. For example, all claims must be within the limitations of the Terms of Market Authorization and must meet the evidentiary standards outlined throughout the PAAB code. Canadian consensus guidelines can be used to support product claims relating to place in therapy. They can also be used to support claims of special status. PAAB has received requests from consensus groups to ensure that the proprietary drug name is not included within a claim directly referring to the guideline if the guideline recommendation only cites the non-proprietary drug name. See ‘example 2’ above. Uh-oh! There are no Canadian consensus guidelines. U.S. guidelines can be considered when there are no Canadian consensus guidelines within the corresponding therapeutic area. Guidelines from jurisdictions outside North America are only considered as the primary support for a claim when they are explicitly recognized/endorsed by a Canadian authoritative medical body as being reflective of current medical practice/opinion in Canada. This is typically evidenced by a letter from the relevant Canadian authoritative medical body on official letterhead. Valid published guidelines from other jurisdictions can generally be used to add further weight to acceptable recommendations from the Canadian consensus guidelines. In such cases, the APS presentation may only convey areas of alignment between Canada and the other region(s). Our November training session will discuss e-detail aids and submission best practice, alongside other topics such as fair balance, digital and evidence. For more details fill in your details to the right to receive our brochure. Lets look at a series of claims for a hypothetical insulin “Jensulin” versus “insulin maspart” for the treatment of Type 2 diabetes. The following are a few ways that you could go off track, and how to get back on track to acceptable content. Copy: Reduce A1C with Jensulin vs insulin maspart in Type 2 diabetes patients (p=0.05). Fix: Reduction in A1C demonstrated with Jensulin vs insulin maspart (p=0.05) in Type 2 diabetes patients. Fix: Consider Jensulin to help towards glycemic control. Copy: Insulins generally have a lower risk of cardiac complications than do incretin inhibitors. Copy: Guidelines recommend adding Jensulin due to it’s favorable effect on HbA1c and lower risk of hypoglycemia compared to insulin maspart. Fix: Guidelines recommend adding Jensulin to metformin, as an option, for uncontrolled type 2 diabetes patients. Making sure that you have the right evidence to support the type of claim you are making should always be one of your first steps. ​Creative ipad apps have become more frequent in the recent years. Creating and submitting an ipad app can seem challenging. Remember that product related apps are subject to sC01.044 of the Food & Drugs Act, so advertising to consumers of Rx drugs is restrictd to name, price and quantity. Here are a few do’s and don’t’s to consider when submitting your app. Is the app provided via controlled distribution for download? Is the app available in the app store? 1) What would PAAB define as a patient material? a. Content targeted to the patient. By ‘patient’, we mean an individual in whom the HCP has decided to initiate treatment with (or discussion about) the corresponding healthcare product. These can be in the form of adherence programs, payment assistance programs, resource locators, access to health care professionals etc. No matter what form your patient solution takes (apps, websites, print pieces), they should provide aid to patients to help them better understand their condition and therapy. 2) Where and how does PAAB see patient material being used? We see patient materials across all media. PAAB is seeing apps, websites, print pieces, videos and more. In the current digital landscape, the ability to reach more patients and provide more material has become apparent. Patient material can now be used in the healthcare professionals’ office, at home and on the go, to help give the patient access to information 24/7. 3) What are the common problems and things to avoid? a. Going beyond the limitations of the Terms of Market Authorization (e.g. discussion of disease consequences/complications which do not appear in the TMA). It’s important to remember that if you are providing information in the context of a brand, you are limited to part three of the Product Monograph (PM). b. 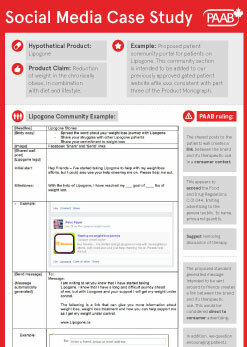 Promotional – It is important to remember that patient information should be non-promotional. The goal of these pieces should be to provide information to the patient to help them further understand their condition and treatment. c. Gating, the pre-gate environment, and secondary audiences – patients may not be the only ones to have access to the content. 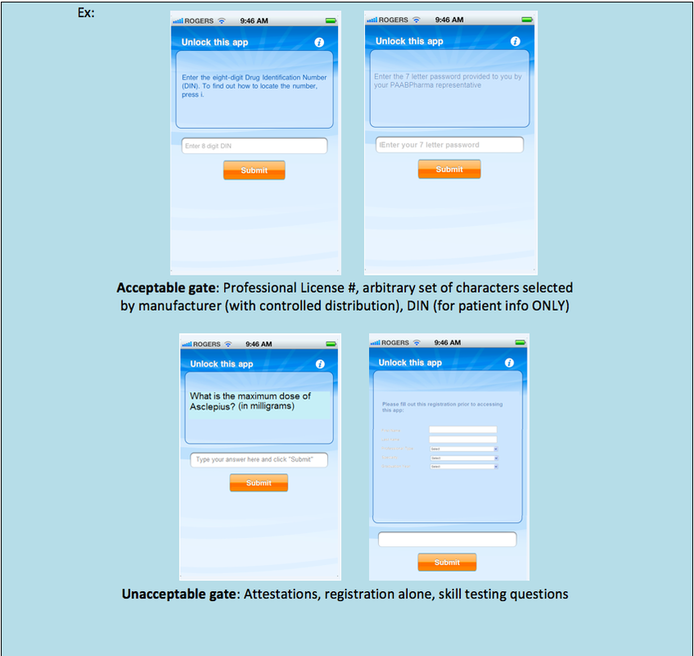 For example, an app may only be accessible by the patient upon entering the DIN, however, the description of the app would be accessible to consumers. 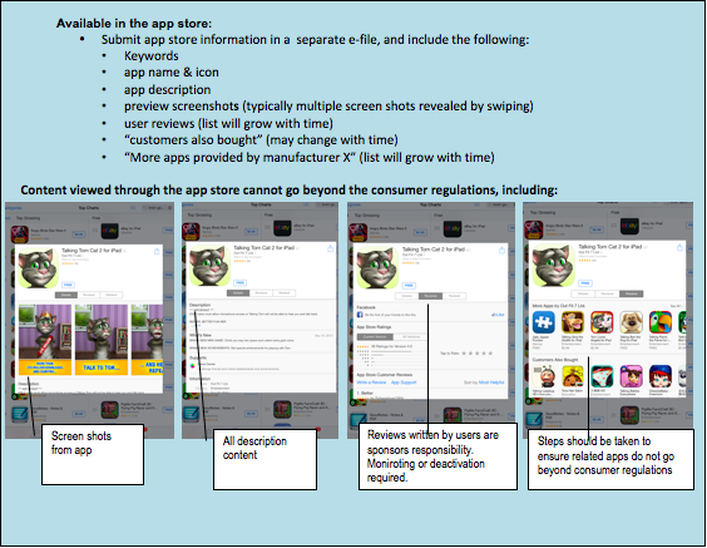 You must therefore consider the consumer regulations when developing material to drive patients to the app. Always consider the possibility of secondary audiences. 4) What advice would PAAB give when developing a patient solution? a. When developing your patient solutions it is important to consider the regulatory framework from the onset. For example, information about drug therapy passed on to the patient should come from part III of the product monograph. Disease information should be supported by authoritative text from standard setting organizations (e.g. Patient groups, medical healthcare professional organizations, medical institutions) AND it should be consistent with part III of the Product Monograph as discussed above. b. 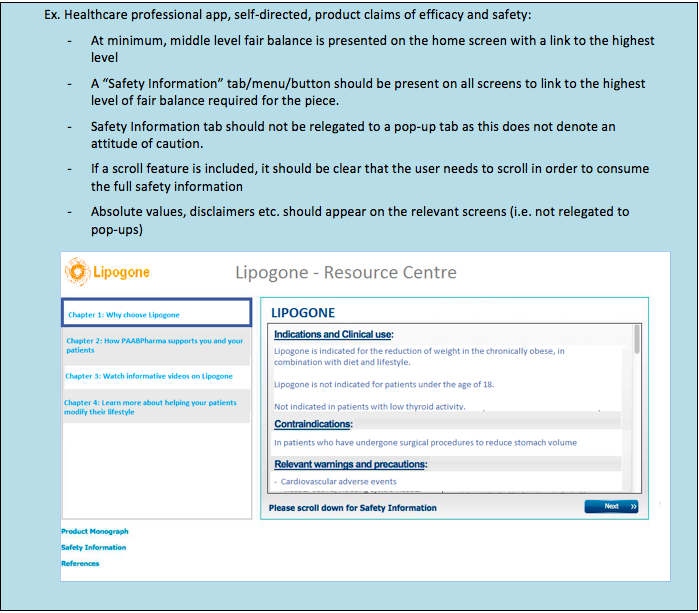 If you are creating an interactive environment (patient – patient, patient – HCP), be cognizant of rules and regulations for online activities. (i.e. company is responsible for the content they host even if they are not generating it). Instructions: Here is the complete journal ad copy deck for the hypothetical biologic Rheumagreat. This drug is for the treatment of the signs and symptoms of rheumatoid arthritis. The layout will follow. Please review it. PAAB ruling: In this execution, PAAB questioned the proposed emphasis on diabetes (i.e. through the proposed image). This was deemed to contravene PAAB code section 3.1 as efficacy and safety has not been established in the sub-population of rheumatoid arthritis patients who have concomitant diabetes. Client revision: The piece was made acceptable by modifying the image. This was the only required revision as the Rheumagreat product monograph does not contain any risks/burdens regarding the concomitant conditions or medications mentioned in this ad. No further note of caution or fair balance safety info required for the concomitant.